You can create key performance indicators (KPIs) within Analysis Services Tabular, but there a couple of foibles that you need to be aware of, as shown by this blog. This is what I'm aiming to get at the end of this page. 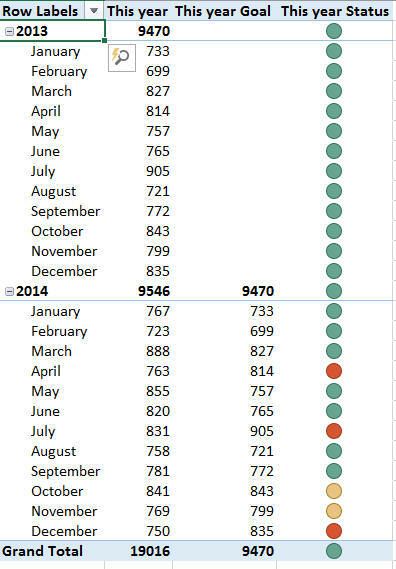 That is, sum total quantity sold, using figures for the same period but in the previous year. Right-click on the total sales measure, and choose to turn it into a KPI. Follow the steps below to complete this dialog box. 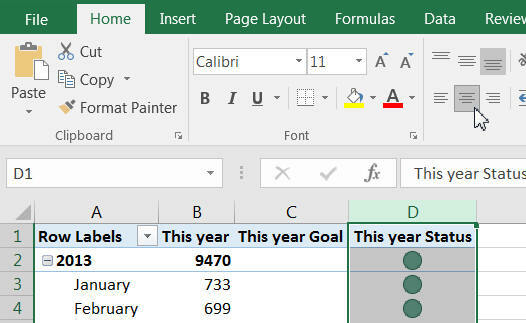 1 SSAS Tabular will show here the measure that you're trying to track. 2 Choose your target measure from the drop list. 3 Either type numbers into the tiny text boxes, or click and drag on the black handles below them to move them. You can also change the type of target by clicking on the diagrams. From top to bottom and left to right, these aim for (respectively) as high as possible, as low as possible, as near a value as possible or as far away from a value as possible. 4 Choose an icon style (but note that a bug means that the left-hand option will be used regardless of what you pick!). 5 Optionally, click to type in descriptions for each part of your KPI. There is very little point in doing this. Yeah - you have a KPI! 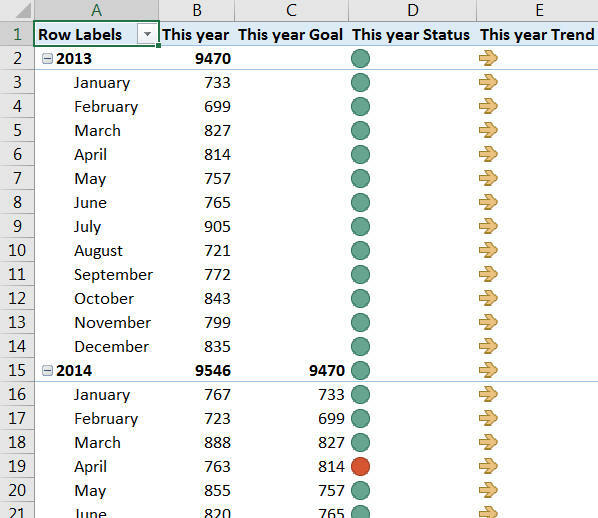 The pivot table fields for the pivot table shown below. The initial pivot table has a few problems with it. There's no point displaying something which can't change. Surely you'd always want this column to be centre justified? What you can't do, it seems, is to get the icon set you chose - as I've mentioned several times already, you get the one shown above regardless of what you asked for. If your icons appear as numbers, deselect and reselect them to get the pictures instead. 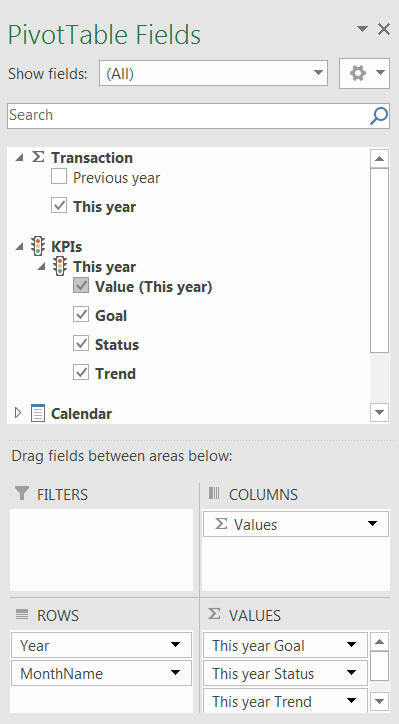 That's about all there is to say about relative KPIs (they show up nicely in SSRS reports based on tabular models, by the way). 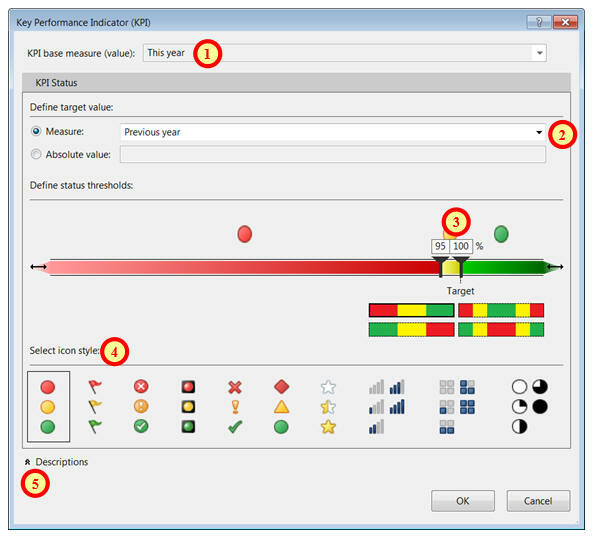 For the final part of this blog I'll just show how to create absolute KPIs, which are similar.